The EIA reported another healthy increase in working gas in storage, which was up 110 Bcf to 1.829 Tcf. The weekly injection was 17% higher than last year (+94 Bcf) and 36% above the five year average (+81 Bcf). The current storage level is now 27.4% below last year (2.519 Tcf, a difference of 690 Bcf) and 31.0% below the five year average (2.651 Tcf, a difference of 822 Bcf). Temperatures in the lower 48 averaged 72.0 degrees, which was 0.6 degrees warmer than last year and 1.1 degrees warmer than average. 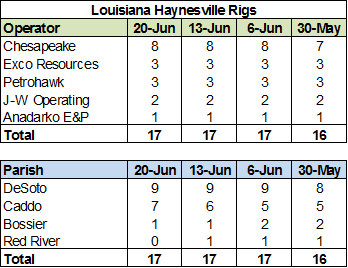 Over the past two weeks, the Haynesville Shale rig count dropped by one to 25. Louisiana held at 17, while Texas lost one (Valence) to end at eight. The Baker Hughes U.S. rig count was up four this week to 1,858. Oil rigs were up three to 1,545, gas rigs were up one to 311 and miscellaneous rigs were unchanged at two. By type, horizontal rigs were up two to 1,250, vertical rigs were down eight to 380 and directional rigs were up ten to 228. The big storage injections continued this week as the EIA reported that working gas in storage was up 113 Bcf to 1.719 Tcf. This week's injection was 23% above last year (+92 Bcf) and 30% greater than the five year average (+87 Bcf). The current storage level is now 29.1% below last year (2.425 Tcf, a difference of 706 Bcf) and 33.1% below the five year average (2.57 Tcf, a difference of 851 Bcf). The Baker Hughes U.S. rig count was down six rigs this week to 1,854. 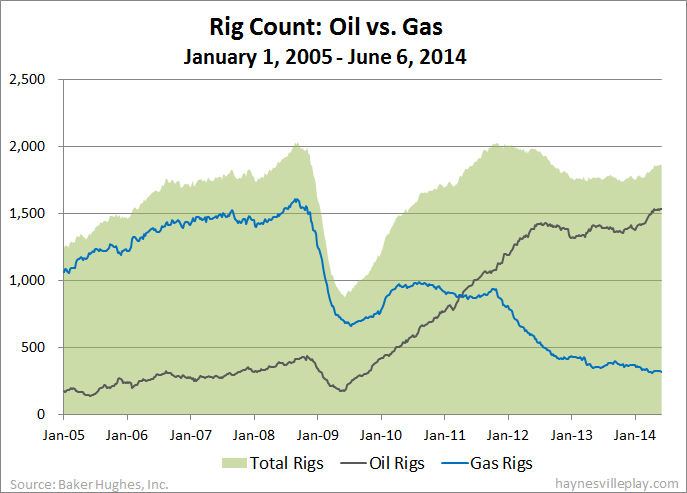 Oil rigs were up six to 1,542, gas rigs were down 10 to 310 and miscellaneous rigs were down two to two. By type, horizontal rigs were down two to 1,248, vertical rigs were down one to 388 and directional rigs were down three to 218. Among gas rigs, horizontal rigs were down eight to 229, directional rigs were down one to 55 and vertical rigs were down one to 26. The EIA reported this morning that working gas in storage was up 107 Bcf to 1.606 Tcf this week. The injection was 10% greater than last year (+97 Bcf) and 22% above the five year average (+88 Bcf). The current storage level is now 31.2% below last year (2.333 Tcf, a difference of 727 Bcf) and 35.3% below the five year average (2.483 Tcf, a difference of 877 Bcf). 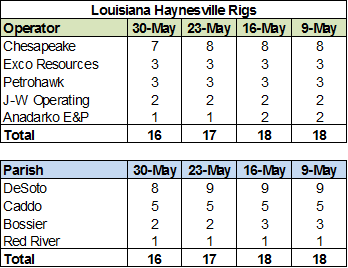 The Haynesville Shale rig count was up one this week to 26. Louisiana was up one (Chesapeake) to 17, while Texas held at nine. The Baker Hughes U.S. rig count was down six this week to 1,860. All of the change was attributable to gas rigs, which were down six to 320. By type, horizontal rigs were down one to 1,250, vertical rigs were down 14 to 389 and directional rigs were up nine to 221. 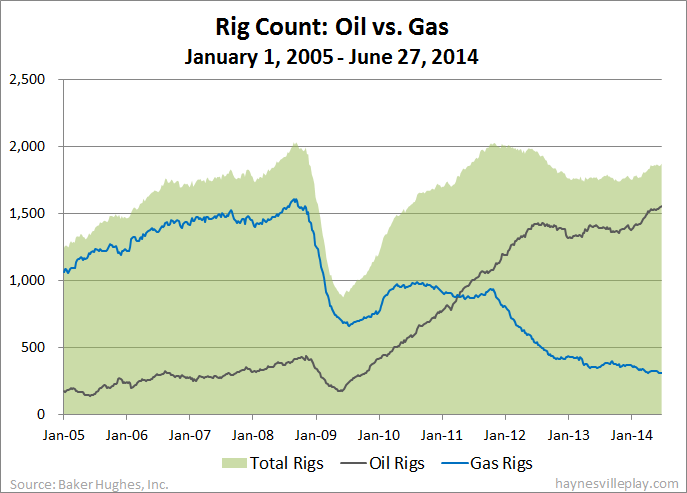 Among gas rigs, horizontal rigs were down two to 237, directional rigs were down four to 56 and vertical rigs held at 27. 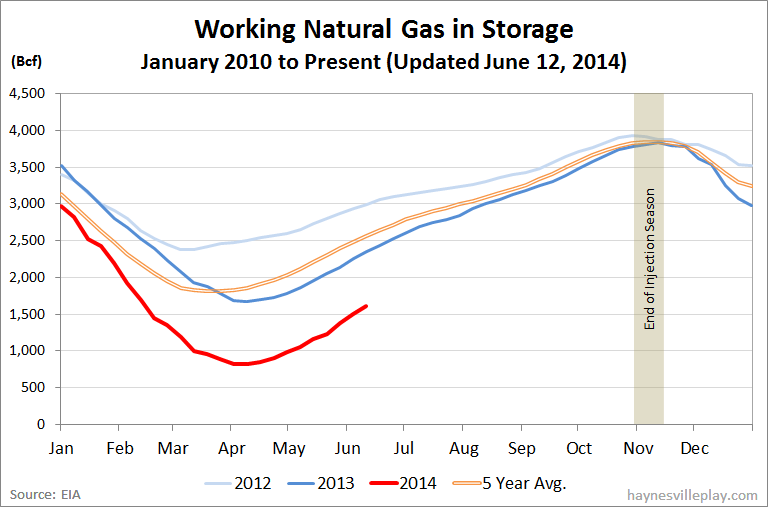 The EIA reported this morning that working gas in storage was up 119 Bcf to 1.499 Tcf. The weekly injection was 10% greater than last year (+108 Bcf) and 28% above the five year average (+93 Bcf). The current storage level is 33.0% below last year (2.236 Tcf, a difference of 737 Bcf) and 37.4% below the five year average (2.395 Tcf, a difference of 896 Bcf). Forbes has a good article on the improvement of BHP Billiton's fortunes in shale gas since its acquisition of Petrohawk three years ago. BHP had pretty disastrous timing in its acquisition of HK and Chesapeake's Fayetteville Shale assets in 2011, shelling out more than $20 billion and then watching natural gas prices drop by more than 50%. The economy is on a steady path to recovery and fundamental gas use (not just cold winter/hot summer) has increased. Natural gas in storage, which has been at record highs for the past several years, is now far below recent averages, and it will take full production to get storage back up to a reasonable level by winter. The Haynesville Shale rig count was down one last week to 25. Louisiana was down one (Chesapeake) to 16, while Texas held at nine. After much anticipation, the EPA today released its plan to reduce carbon dioxide emissions from power plants by 30% from 2005 levels by 2030. This is something of a compromise proposal that has something for everyone but still disappoints all involved. In other words, probably a fair compromise. The 30% reduction will please environmentalists, but backdating the baseline to 2005 will please the utility industry. Additionally, the individual states will have the flexibility to set up their own plans, so they will not have a scheme dictated to them from above. Bottom line, this is a win for natural gas because utilities will have to continue to reduce their coal consumption and shutter coal-fired plants. In reality, market forces and older environmental regulations were already doing this as utilities opt not to invest in older coal-fired plants and retire them instead. These new carbon regulations might accelerate the process somewhat but they really don't change the big picture a whole lot.